When Commander John Rodgers relinquished command of Ford Island’s naval air station to Lieutenant Commander M. B. McComb (May 5, 1925), he was set upon a flying venture which would draw the awe and admiration of the entire world, and for Hawaii open up a new future. After a number of years in preparation, the Navy was ready to put into action its plan to span the Pacific Ocean between the mainland and Hawaii. Naval planes had been stationed in Hawaii, but as for the Army, they had been brought there by surface craft. Now, technological advancements made it possible to undertake a direct flight (up to then, no Navy craft had flown beyond 1,200 miles non-stop). Specifications for the three flying boats to be used included an ability to carry five people and one ton of freight each. The Navy’s second man to earn pilot’s wings, Rodgers was selected to command the air venture. Nominally in command of the entire project was Captain Stanford E. Moses who was Commander, Aircraft Squadrons Battle Fleet. The flight route was established from San Francisco on a Mercator course for Maui, thence to Pearl Harbor on Oahu. The plan was for all three planes to make the journey into history. The Naval Aircraft Factory went ahead with construction of two airplanes, the PN-9 No. 1 and PN-9 No. 3, expanding on the twin-engine PN-7 and PN-8 models with a larger center hull and an engine on either side of the biplane’s center line. The Seaplane’s specifications were as follows: wing span, upper wing 72’10”; weight empty, 9,400 lbs. weight at take-off for Hawaii flight 19,500 lbs. useful load 10,100 lbs.–51.8 per cent of total weight; power plant, two Packard engines of 500 hp; propellers, two-blade wood, diameter 13 ft. A useful load of 52 percent is an exceptional performance. Even today, there are few planes which can carry a useful load equal or greater than their own weight. Admiral Moffett wanted to experiment with a novel arrangement by placing the engines in tandem along the center line, back to back, so an order was placed with Boeing Airplane Company of Seattle, Washington, for the PB-1’s manufacture. Moffett and the Navy, therefore, would have two versions of flying boats competing for the first crossing title, it remaining to be seen which was the better design. The Philadelphia facility had access to a new type of engine using the reduction gearing principle, the Packard 1A-4500 of 500 hp. Also available was the product duralumin. An alloy of aluminum, copper, manganese and magnesium, it compared to mild steel in tensile strength but weighed much less. These major innovations, plus other aids, combined to produce a machine which could provide a large fuel capacity, greater weight-carrying capability, a wider cruising radius, increased dependability and improved safety. Engineers in Philadelphia felt the PN-9s could fly the entire distance with favorable tail winds. If short of destination, plans were made to land and refuel from one of the station ships along the flight route Construction and testing continued throughout the waning weeks of 1924 and early 1925. Rodgers determined his time in the air would be devoted to the most important task of the trip, navigation. Commander Rodgers was one of the pioneers in the development of the science of navigation as applied to seaplanes. Rodgers, since no satisfactory bubble sextant had been developed, combined parts of several sextants to make one which proved to be very satisfactory. Boeing gave to the PB-1 the name of FLYING DREADNAUGHT. The description was “five-place flying boat biplane, open cockpit, patrol (5POFbB),” officially recorded as BAC Model 50 and BAC Serial Number 80 Only the best people were assigned to work with project chief L. Egtvedt—at this writing Boeing Company’s Chairman of the Board. Its engines were also Packard products. The 2A-2500s developed 800 hp at 2,000 rpm. They were positioned between the hull and upper wing, turning one tractor and one pusher propeller. Of birch with metal tips, the four-bladed propellers were manufactured by Hamilton. Five cockpits were in the PB-1. An all-metal airplane, only the upper section of the hull was wooden. Wings were dural and steel, covered with fabric. This design provided an internal passageway between cockpits for in-flight communication. It was capable of carrying 1,700 gallons of fuel, a maximum 25,000 lbs. in weight (a record carrier). Top speed was 112 mph, cruising at 94. On May 1, 1925, while five balloonists were drifting across the United States in a national elimination race, the first PH-9 was making a world’s non-stop endurance record for seaplanes at Philadelphia. Tests continued under close scrutiny of Rodgers and his crew of experts at the Naval Air Station, San Diego, California. On August 26, the PN-9s were flown to San Francisco. San Pablo Bay, a quiet body of water forming the northern portion of San Francisco Bay was chosen by Rodgers for the take-off point. The PB-1 was delayed at the Strait of San de Fuca, when one of its engines developed trouble in its oil system and could not start. Flying on one good engine later, it joined the others at Crissy Field where a seaplane ramp was available for pulling the planes out of the water. After waiting several days for a forecast of favorable winds, finally on August 31 both PN-9s were ready for flight, but the PB-1 was further delayed. The flag-plane, PN-9 No. 1, carried for its crew Commander John Rodgers, Flight Unit Commander and Navigator; Lieutenant B. J. Connell, Pilot; W. H. Bowlin, 1st Class Aviation Mechanic’s Mate; Flight Engineer S. R. Pope, Second Pilot; and O. G. Stantz, Radio Operator (Bowlin was also a pilot). For the PN-9 No. 3, there were Lieutenants A. P. Snody and A. Gavin, N. H. Craven, C. J. Sutter and C. W. Allen. Lieutenant Commander J. H. Strong was placed in charge of the PB-1, assisted by Lieutenant R. W. Davison and Lieutenant R. Botta. Rodgers came to the assignment as flight Commander from a short tour as Commander of the USS WRIGHT, aircraft tender with the Aircraft Squadrons Scouting Fleet. The eyes of the world turned toward California and Hawaii, the body of water lying ominously between, and to the men who were about to attempt to fly the distance for the first time. People were awe-struck at the test of man and equipment which was about to take place. Probably primary in consideration was the difficult job of navigation which had to be done, for the Hawaiian Islands were to aviators a mere few rocks jutting out of the Pacific; it was a task for planes to manage landing on fields on continents without error. Because the Navy was experienced in navigation, there was some measure of confidence in the project’s success, yet it appeared incredibly difficult and dangerous. The Navy’s role came in handy for another function, the placing of ships along the flight route. Strategically positioned along the course at 200 mile intervals were 10 Navy craft to act as checkpoints, for emergency use, and to give the planes radio bearings as shore stations would do. During the day, their smoke clouds would mark the proper path and at night searchlights would do the same. In order of position from California were: WILLIAM JONES, MCCAWLEY, CORRY, MEYER, DOYEN, LANGLEY, RENO, FARRAGUT, AROOSTOOK and TANAGER. The TANAGER was to be positioned 80 miles from Maui. In addition, merchant vessels enroute would be asked to keep a sharp lookout; also, to use their radios as little as possible so as not to interfere with vital radio communications between planes and ships. Each plane was equipped with a radio transmitter and receiver working only on 550 kilocycles. The planes were not equipped with radio compasses but the guard ships were (except for mine sweepers), giving them a capability of taking radio bearings of the planes on 550KC. Commander Rodgers and his men got into their airplanes. Rodgers took along a sealed thermos of poi, a favorite native food given to him by Honolulu friends. Admiral Moffett, Captain Moses, along with the Army’s pioneer aviator, Colonel Lahm—who delivered a sealed barograph in case any records were established—chugged up in a motor boat to wish the flyers good journey. Army planes from nearby Crissy Field dipped and circled, as if to entice the seaplanes on their way. The official weather report was rushed up to the PN-9s at the last moment, advising the use of 1,000 to 2,000 feet for flying altitudes. Eagle boats, submarine chasers and Coast Guard cutters had done a good job patrolling the Bay to keep craft away so the flying boats could make the long straight-away take-off run unhampered. Rodgers’ plane carried 1,278 gallons of fuel in tanks and 50 additional in five gallon tins. The weight of the fuel kept the plane from getting “on the step,” when the long awaited take-off was attempted by PN-9 No. 1. Lieutenant Connell was at the controls, helped by Pope. They made one run across the Bay but were unable to get the seaplane into the air, turned around for another try. To decrease weight, previous to their takeoff, the crew had gone through the ship with a fine tooth comb and tossed out things like parachutes and equipment,” Connell recalled. In the meantime, Snody moved into position and knifed heavily through the Bay in PN-9 No. 3. The huge flying boat became airborne at the official time of 2.41:2 ½ p.m. In position once again, Connell moved his throttles forward. The Navy craft skimmed at least four miles atop the shallow water before finally lurching into the air. It was 2:55:8 4/5 p.m. Missing from view were the thousands of well-wishers urging the aviators on their way. Local weather conditions were excellent as the flying boats made their way across the San Francisco Bay and the Golden Gate. Passing through the Golden Gate, at 150 feet altitude their speed was about 80 mph. “We were so heavy,” Connell recalls, “we had to go 40 miles before we could climb to 300 feet.” After having established radio communication with shore stations, the crew relaxed and were comfortably on their way. Commander Strong remained fretfully behind, as work continued on his PB-1 so it, too, could get airborne. Intent on an aerial journey the likes of which the world had never known, the Navy craft proceeded westward with its crew fully aware of the importance of their flight. 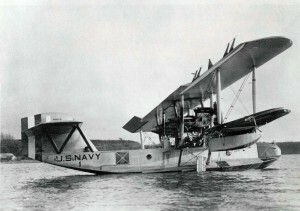 Weeks of practice, test, and re-test were behind them, as were the wishes of hundreds of people from Philadelphia, Seattle, and the sub-contractors who had molded together their efforts to produce the aircraft The entire Navy, as well as the spirit of every aviator who had ever flown, was behind the two flying boats and their crews. For awhile, it looked like two seaplanes would complete the trip, for Strong was to be left behind. The entire group had hoped to celebrate together in beautiful Honolulu. At 5 p.m., both seaplanes made radio contact with the WILLIAM JONES and their bearings were checked, 200 nautical miles from San Francisco. After passing the WILLIAM JONES, Lieutenant Snody’s plane suffered a broken oil pressure line and was forced to light on the sea, only 300 miles from the starting point. The placing of ships along the route paid dividends, as the WILLIAM JONES headed for the reported position, as did the McCAWLEY. The helpless seaplane bobbed and listed like a heavy cork for several hours and was finally found at 2 a.m. The disheartened crew was picked up by the first ship and the seaplane towed back to California. (On September 2, while being towed from Crissy Field to Mare Island, the plane capsized and sank.) Rodgers and his crew doggedly flew on in PN-9 No. 1, keeping in communication with flight headquarters and the ships on station. During the night the flight was uneventful. An altitude below the cloud ceiling was maintained so that Rodgers could obtain the angle of drift. This was determined by using a drift meter and sighting an aircraft flare which was thrown out of the plane and ignited when striking the water. These flares or float lights burned about 5 minutes. Position checks revealed the plane to be on course and all station ships were sighted. The wind leaving San Francisco was from the west, gradually changing to north when 200 miles out. The weather report had indicated that the plane would hit the northeast trade tail winds about 450 miles from San Francisco. The trade winds did not materialize and during the night the winds were “abeam” and very light, averaging one to three mph from the McCawley, 400 miles from San Francisco for the next 800 miles. NE trade winds 7 to 10 mph were not encountered until the RENO was reached 1,400 miles from San Francisco. When the plane passed the USS LANGLEY, 1,200 miles from San Francisco, at 7:40 in the morning, the wind was reported by the ship to be less than 3 mph. Rodgers had expected strong tail winds of 15 to 20 mph beginning 500 miles from his starting point. The flight commander later stated that he knew when he reached the LANGLEY that he would have to land and refuel from one of the station ships. He later sent a radio message that he would have to land and refuel from either the AROOSTOOK, a seaplane tender, or the TANAGER, both equipped with aviation personnel and fuel for just such an eventuality. After passing the destroyer RENO, 1,400 miles from San Francisco, Commander Rodgers decided to land at the aircraft tender AROOSTOOK, refuel and make another take-off for Honolulu. By radio he informed the ship of his intention to land and take on fuel. When the plane got within 200 miles of the AROOSTOOK, radio compass bearings were requested of the ship. The bearing, which later proved to be in error, indicated to Commander Rodgers that he was south of the ship. Rodgers change course to the north and “ran down” the bearings. He continued to search for the ship until the fuel was exhausted. There were a number of small local rain squalls in the area which also, probably, contributed to the difficulty of locating the ship. Honolulu sobered, so did the rest of the listening world. Rodgers had been forced to land about 300 miles from Maui and approximately 365 miles from Honolulu. Pope, during the last minutes of flight, under power, discovered gasoline in the bilges. Grabbing a sponge and bucket, he scurried to all ten tanks in the fuselage and desperately managed to soak up about two precious gallons. The final message was, “We will crack up if we have to land in this rough sea without motive power.” Both engines then cut out and the plane began to glide down from 800 feet. Connell brought the plane down at 4:15 p.m., September 1st, to a perfect landing without power in heavy swells, after 25 hours and 23 minutes. The plane had flown a distance of 1,870 nautical (2,155 land) miles and had established a world seaplane record for distance. The average airspeed was 70 knots, average ground speed 73 knots. Guard ships FARRAGUT and AROOSTOOK headed for the second downed seaplane. The LANGLEY headed toward the area and later dispatched its planes on search missions. The discouraged crew members said nothing to one another, as their seaplane bobbed noiselessly on the heavy seas. Three months of almost night and day preparations showed its toll in crew exhaustion. Connell, who had been in the cockpit over 25 hours, fell into a deep sleep. Sure of being found by the tender, the men fully expected to refuel and continue on their way to Honolulu. A four-hour watch was established and all of the crew not on watch got some needed sleep. Tired eyes searched for the AROOSTOOK in vain. At Ford Island, thousands of anxious greeters waited with wilting lei for the aviators arrival, finally drifting away in the afternoon when there was no further word from Rodgers. The United States mid-Pacific military might was corralled. Patrol planes, ships and submarines joined together in the biggest sea-combing expedition to date. They covered the territory between the 21st and 23rd parallel of latitude and 153rd and 155th meridian of longitude. In too short a time, it was night and searchers had to wait until morning to resume rescue efforts. Next morning saw more vessels in the search group, now a total of 23, helped by several scouting planes. Days and nights went by without word or sight of the plane. The WHIPPOORWILL reported seeing night flares, raising hopes of would-be rescuers, but the source could not be located. More ships and planes were added to the search fleet, including some on their return trip from Australia (they, however, searched the area west of the Island group). Still no sign of the plane. When the plane lighted, the crew knew they could not transmit messages on the radio. Power for sending depended on a wind-driven generator mounted on the wing which operated only when the plane was in flight. The receiving set functioned well on battery power. Regularly, they were frustrated hearing exchanges of conversation between guard ships. One message from the AROOSTOOK addressed to Commander Rodgers said, “Cheer up, John, we’ll get you yet.” A message was intercepted telling of the loss of the airship SHENANDOAH. Positions of the searching ships and search plans were intercepted and plotted. One day the searching ships reached a position within 30 miles of the plane. After plotting the search for several days, it was evident that the vessels were getting further away each day. Stantz, the radio operator, worked continually trying to improvise a sending set. An attempt was made to drive the radio generator by means of a hand-driven starter removed from an engine but without success. The third day the weakened flyers saw smoke from a steamer heading for the Islands. Flares were shot off by Rodgers’ crewmen and smoke signals were sent. Someone even waved some fabric to draw attention. The ship passed serenely by, about five miles away. When it was apparent the plane would not be found, Rodgers and his men decided that they would have to sail the plane to land if they were to be saved. They improvised sails from fabric cut from the lower wing and fastened the fabric between the upper and lower wings. Facing the wind, the plane caught the ocean breeze and moved along at about two knots an hour. One of the crew, at all times, manned the controls and steered a compass course, controlling the direction with the rudder. The course, however, was limited to a few degrees from the direction of the wind. Another member of the crew stood a lookout watch. After three days, the food supply was exhausted. The water was carefully rationed to a few swallows each day. At one point a slight rain fell. Some water was caught in the fabric stretched out on the hull, but very little. The men licked the moist fabric and the hull to obtain moisture. Rodgers distilled some seawater with the still given to him before leaving California. Gasoline was required to operate it. This being their scarcest commodity, the men burned wooden ribs taken from the wing’s trailing edge for fuel and managed to eke out a mere quart. The supply of water ran out entirely the sixth day, eliminating the need for further rationing. However, the eighth day it poured heavily and the crew got their fill of water. Connell said, “The rainwater caught on the fabric sail picked up aluminum paint but it was the drink of a lifetime. It saved our lives. We didn’t miss the food; after the third day or so without it you get over being hungry. But water is different.” Before the rain, the physical condition of the crew had reached a point where walking was difficult. Most of the men had to crawl on hands and knees in changing stations. The unique sailing rig moved the plane an average of 50 miles each day. The eighth night the crew saw searchlights, calculated to be coming from Schofield Barracks, about 100 miles away. The following morning, Oahu could be seen sitting majestically in the distance. Then the efficient receiver revealed another conversation. It was the LANGLEY transmitting to rescue headquarters: “Twenty-one aviators on the LANGLEY concur the plane had sunk and the search should be discontinued.” This confirmed Rogers’ opinion that they would have to sail all the way. The course they were now making good would pass through Kauai channel and not touch land at all. Needing more underwater surface for steering control, Connell decided to rig an artificial keel. The men pulled up some of the metal floor boards and three pieces were lashed to the hull with control cable, giving about 20 square feet of underwater surface. The reaction was immediate. Unwieldy and requiring continual adjustment, the make-shift keel, or lee boards, responded nonetheless; they enabled the plane to steer a course 15 degrees on either side of the wind direction. Without them, Rodgers stated upon arrival in Honolulu, it would not have been possible to make Kauai. When it became certain that their course would take them through Kauai channel and miss Oahu, the course was changed to Kauai. The run across Kauai channel was critical, for if that island were missed, the crew felt this to be their last chance. Rodgers took star sights all though the night, at frequent intervals. A course was set to reach Kauai off Ahukini Harbor. Commanded by Lieutenant Donald Roderick Osborn, the submarine’s pleased crew pulled up closer, threw a heaving line and passed five gallons of fresh water and some canned fruit to the grateful pioneer flyers. Osborn offered to take Rodgers and his men on board. In the best tradition of the Navy, Commander Rodgers refused to leave his craft until she arrived at her destination. They had flown and sailed the plane to Kauai and since all danger of missing land was past, Rodgers and the crew throught they could sail the plane into Ahukini Harbor, and so informed Osborn. Osborn hesitated, as his crewmen look quizzically at one another, then stated he thought the PN-9 should take a tow. Lieutenant Osborn was informed of the decision and promptly latched onto the fuel-less seaplane. The strange sea-train made for Nawiliwili on the opposite side of the island. Ahukini was too shallow for a submarine. The submarine towed the plane just inside the breakwater. Here, on account of shallow water, they were forced to cast the plane adrift. By this time it was dark. The PN-9 floated alone in the outer harbor. Finally, a small rowboat arrived with Mr. Rice who attempted without success to tow the plane closer to shore. Later, a larger boat came up with four oarsmen and brought an anchor. This boat towed them to sheltered water. The pioneer flyers anchored their seaplane themselves and delayed going ashore until everything was shipshape and well secured. Then they climbed into the boat and made for shore. At Nawiliwili they emerged to find the small population of Lihue out to greet, garland and fete them. It was 9 o’clock in the evening. Thus Commander John Rodgers and his crew, in the PN-9 No. 1, succeeded in reaching Hawaii from the mainland, though not as planned. They covered a distance of 1,870 miles in the air, an official world’s record, followed by an incredible sail of about 450 miles, in nine days to Kauai. Naval Headquarters in Washington had reacted to first news of Rodgers’ sighting by announcing his elevation to Assistant Chief of the Bureau of Aeronautics. At the same time, A. W. Van Valkenburg, in Honolulu, stated to the press that Rodgers had done more to advance commercial aviation in the Islands than any other flyer. Unhesitatingly, a movement was inaugurated to name Honolulu’s airport after him. (Two years later, Hawaii’s first and greatest commercial flying field was so named. In 1947, it took on the title of Honolulu International Airport and in 1962 the airport terminal building took on the name of John Rodgers.) After a night’s rest and medical observation at Nawiliwili, they boarded the destroyer MacDonough for transportation to Honolulu. Upon arrival, the crew was promptly hospitalized for medical examination and rest. The Navy medical officers seemed surprised that they could find nothing wrong with any of the crew except about 20 pounds loss of weight, considering the fact that they had gone without food for a week and had a very limited supply of water. John Rodgers handed the first letter to arrive in Hawaii from the mainland by seaplane to Governor Farrington. The barograph to substantiate the official distance record was also delivered to the Governor. Rodgers carried another letter addressed to Admiral McDonald, Commandant of the Naval District. The PN-9 No. 1 followed its crew to the Naval Air Station, Pearl Harbor ferried on the stern of the USS Pelican. On Sept. 19th, the repaired plane soared majestically over Honolulu, circling Diamond Head and Koko Head. The USS Idaho was assigned to transport the five aviators to San Francisco for a reception planned by the city. Californians were disappointed because they had requested that the USS California be designated. Nevertheless, on the 17th of September, the flying heroes reverting to sailors bid a fond Aloha to beautiful Hawaii and sailed quite comfortably for San Francisco. Seaplanes bade an impressive flying farewell by dropping 50 paper lei on the ship and adjacent waters. taken on Kauai after their arrival, ten days after departing California. Cmdr. Rodgers, Naval Aviator No. 2, lived only one year after the Hawaiian flight. While serving as the Assistant Chief of the Bureau of Aeronautics, he was killed in a single engine plane crash in the Delaware River near the Naval Aircraft Factory, Philadelphia on August 27, 1926. He was making this trip to the Naval Aircraft Factory to inspect two PN-10 model seaplanes with Packard engines of greater horsepower than the PN-9. Cmdr. Rodgers hoped that he would be permitted to make another flight to Hawaii when the PN-10s were completed. The mechanic with Cmdr. Rodgers survived. Lieut. Connell was waiting at the field for Cmdr. Rodgers to land and helped to pull him from the wrecked plane which had spun into the Delaware River close to shore. The significance of this historic flight is recognized when one recalls it took place while Charles A. Lindbergh, who flew solo across the Atlantic two years later, was still a barnstorming pilot. The feat will remain an epic adventure in pioneering history. A great stimulation to development of aviation appeared to hinge on the success of the Hawaii flight. Like race horses at the starting gate, aviation industry and its enthusiasts waited impatiently for the flight’s anticipated completion before unleashing its improved technological might for the surge forward to bigger accomplishments. It took only a few hours of flying time to hint at the venture’s success. The flight proved that the Navy had developed a seaplane which could carry a 50% useful load, an unheard of performance in 1925. Weight savings resulted from the use of an aluminum alloy hull. The plane had flown a distance of 1,870 nautical miles (2,152 statute miles) and had established a new world distance record. Its seaworthiness had been proven beyond a doubt. All of these facts proved that commercial flights over oceans by seaplane were practicable. As a result, seaplanes were adopted by Pan American in 1935 when the first commercial flights to Honolulu from California were originated. Sikorsky amphibian planes were also used first for inter-island flights. As a result of the Rodgers flight, aviation people became greatly interested in the possibilities of commercial over-water travel. A flurry of activity emanated within aviation circles. Forces were put to play which were to improve airplanes and supporting facilities. Commercial aviation interest surged. Man wanted to fly great distances and was bound and determined to do it. Preparations were made for the day. The PB-1 did not attempt the flight to Hawaii as it was found necessary to replace the Packard liquid cooled engines with Pratt and Whitney R-1690 Hornets. The plane was later assigned to the Naval Reserve Unit at Seattle. Lieutenant Connell continued to make aviation history. He went on to establish seven world and 14 United States records in 1927 for Class 2 seaplanes for distance, speed, altitude and duration in a PN 10 model airplane before retiring from the Navy as a Commander in 1947. Commander Connell now resides in Lanikai, Hawaii. Hawaii made the most of its important position in mid-Pacific by intensive efforts to receive the first airplane from the mainland, knowing full well that before long Hawaii would become a key platform for airplanes flying the Pacific. The National Aeronautic Association chapters in Oahu and Maui combined for an intensive drive for airport improvements. Probably of equal importance to the Islands was interisland commercial flying on a large scale. If mainland aircraft manufacturers could build planes to fly 1,870 nautical miles, then this operation would be only a question of time. Needed would be public acceptance of flying and, of necessity, financial support. The Rodgers flight seemed to be the spark to ignite a desire for air travel in Hawaii. Interisland operation of any magnitude, however, was not to be established for four years and commercial flights to the mainland for 10 years.